Disclosure: I was compensated for this post. I also received a sample of the product for review purposes. The opinions are my own, based on my personal experience with the product. Over the years I’ve had many friends successfully lose weight following the Weight Watchers plan of counting points. I’ve often thought of trying it myself to see how I would like it, but just haven’t yet. I do watch what I eat and am careful not to overindulge. I’ve lost over 60 lbs since 2012 and according to my doctor, I’m at a healthy weight for my height. I’ve noticed Smart Ones frozen entrees in my grocer’s freezer section before, but hadn’t tried them until just recently. I don’t eat frozen dinners as often as I used to, but I like to have a few around the house for a quick meal when time is short. When I was working my 9-5 job, I used to bring a frozen entree to work for lunch every day. These would have been perfect! Now that I’ve tried them, I will definitely be picking up more the next time I’m out shopping! Smart Ones is part of the Weight Watchers brand and are great for people who are watching their weight. They are portion controlled and you know exactly how many calories, grams of fat, fibre and protein you are getting for each meal. If you visit the Eat Your Best website you can see how many points each is worth too if you are tracking your eating that way. I picked up two Smart Ones frozen entrees for John and I. John ate the Gourmet Homestyle Beef Pot Roast and I tried the Signature Spicy Szechuan Style Vegetables & Chicken. The Signature Spicy Szechuan Style Vegetables & Chicken has 240 calories, 5 g of fat, 4 g of fibre and 11 g of protein. 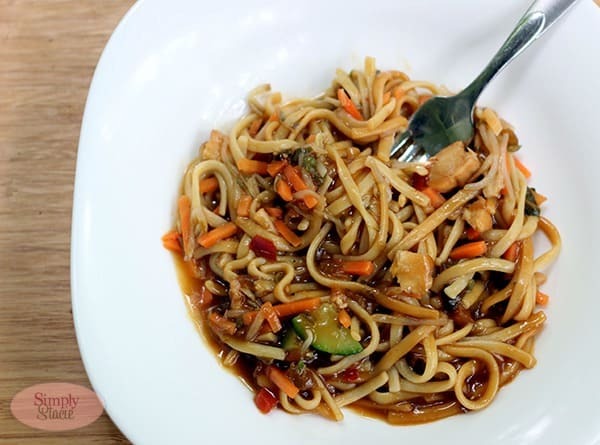 It contains a mix of veggies including carrots, zucchini, bean sprouts, red pepper with chunks of glazed chicken in hoison sauce. Its served on a bed of Lo Mein pasta. It took about 4 minutes to cook completely in the microwave. After letting it cool a minute or so, I couldn’t wait to dig in. It was spicy, but not overpowering. I noticed the spicy flavour hits after you have swallowed! I also found it the perfect size for me and my hunger was abated after eating. John’s lunch was the Gourmet Homestyle Beef Pot Roast which has 180 calories, 4.5 g of fat, 4 g of fibre and 17 g of protein. It had cubes of beef pot roasted covered in gravy with carrots, onions, potatoes and green beans. He’s a meat and potatoes kind of guy so I was hoping he would like it. I didn’t tell him it was Weight Watchers though! It was ready after 5 minutes in the microwave and I snuck a quick bite before I served it to John. It was yummy! I love comfort food, but don’t often eat it anymore! John also enjoyed it and said he would eat it again. He’s fairly picky and doesn’t always like trying new things so I was pleased to see he cleaned his plate. When I was shopping at the grocery store, I noticed the large selection of Smart Ones products. In fact, it was a tough decision just settling on these two since there were many that appealed to me. Some of their other varieties include Chicken Parmesan, Salisbury Steak, Slow Roasted Turkey Breast, Shrimp Marinara, Broccoli and Cheddar Roasted Potatoes and many more. Visit the Smart Ones website to see the full line up of products. You can also connect with Smart Ones on Facebook via the Eat Your Best Canada Facebook page. I’ve never tried Smart Ones, but I think I will now after reading this. Your chicken looks delicious! This looks like a quick and tasty way to eat lower calorie meals. I love Smart Ones – they are reasonably priced and always taste fresh…I keep a few in my freezer all the time. I had tried Smart ones. I really like them. Nice for lunch. I would totally eat these if they were lower in sodium. While I am a firm believer microwave meals are too high in junk like sodium and could be made healthier at home (and cheaper) – I DO love the fact they help with portion control. Yum! These look really good. They would be useful for a quick easy meal for one or you could use them in a “Semi-homemade” recipe. My daughter will take one, microwave it for not quite the full time and put it in a couple bell peppers. Then, she puts them in the crock pot for a delicious stuffed pepper. 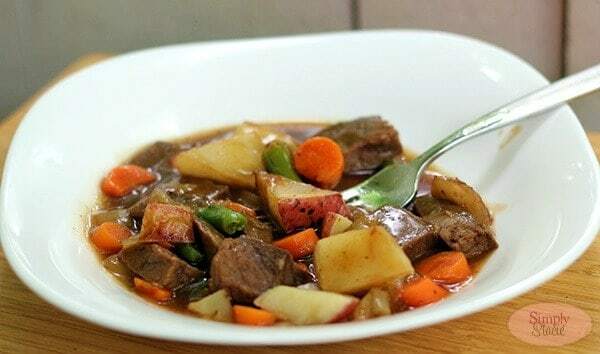 You can always bulk them up with added steamed veggies to make them a wonderful dinner for your family. These look actually really good for a frozen dinner! I think I will pick some up for a quick lunch during the week, when I am too lazy to make myself something! Smart Ones has some great, tasty meals and a good variety, too! Plus, they’re very reasonably priced! I have eaten Smart Ones before and I liked them. They have a lot of variety to choose from. I would eat these in place a a meal anytime too. Thank you for the review on these meals. Some times I just want a quick fix for lunch but have been reluctant to buy these frozen meals. I will give them a try. I’m typically a cook from scratcher, but it has been too hot and too inconvenient, so I’ve been picking up sandwiches – these look great – I’m going to give them a try!!! I actually tried these, and they’re great! I sampled them one night, when I was babysitting. So far, I like everything they make that’s either a dessert, or Italian!